Liam, I never thought of the lighter aspect of it before, but that is true. It definetely does vent too! How much of that stain is really from the key way is very little. You can see that with the drownish stain in the keyway. Most of that stain, isn't from condensation? OldS the picture in the bible is a way to install slate that is ligther and cheaper. It may be better for venting. OS is correct on all accounts. Often as not, when I have to find a leak, it's built-in as often as it is a broken slate. Tight is nice, but makes cracked slate hard to see. Having a nice headlap is critical either way so wandering water always has a slate to land on. Lockout, I believe so; not too much, but you can see the light brown deposit there, and I would imagine that was caused by the water running and bringing the dirt with it; thus the stain. As far as butting or laying the slates "loose", obviously both work. If you are trying to lay the slate with the joints lined up, you have to be consistent with the way you lay them. On the other hand, in the slate bible there are pictures of slate laid on a barn roof wwith the joints WIDELY spaced to allow the air to vent out the roof. I would imagine that they left a lot of open areas on the sides of the barn so that the air was constantly flowing from the inside to the outside and the water was kept from entering to a great extent by this movement of air. IMO, leaving space between the slates is not a bad thing. You want to make it easier for the water to flow down and off the roof than it is to flow between and into the house. Don't try and fight the water, you will loose 100% of the time! I don't think leaving a gap would have made any difference. There will capillary attraction whether there is a gap or not. The bigger the gap, the less distance water will have to travel to infiltrate the roof. If you look at the right side of the slate, you can see how far the water infiltrated underneath the slate. Not enough to reach the nail, which is the point of putting the nails where they are and also the point of not leaving a gap. The wider the gap, the farther the capillary attraction will draw the water toward the nail. I doubt that it caused much for leakage . I like my slates butted tight together to add help in keeping them in line , instead of each being independent . Thanks Old School for enlighening me...I assume that the keyway would have broken the capillary action and the water would drain down onto the center of the bottom slate. It's hard to see the ridge in the photo but the tracking line is pretty obvious. 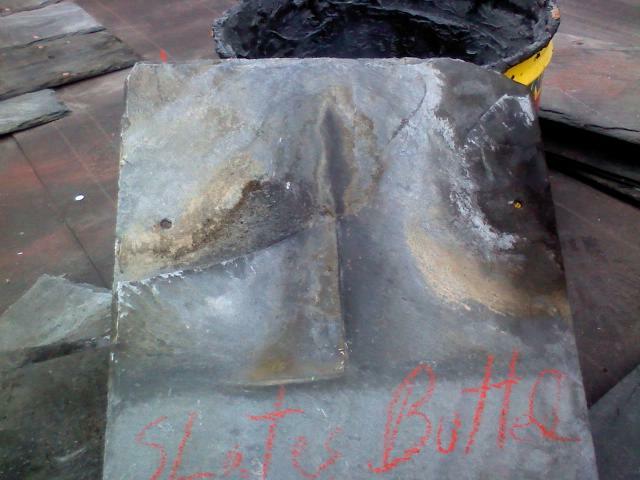 Did the leak occur in the left nail hole of the pictured slate ? Look at the left side of the slate. It has a ridge and the water has been following that ridge to the left and dumping right at the top of the next slate to the left beneath it. The fact that the slates were butted tight together in this instance made it easier for the water to run to the left and into the building than between the slates and down onto the slate below and off the roof. A "built in leaker"
Good to have you on the forum! Hi, Could you please elaborate on what is wrong with this slate or slating technique for the uninformed ? ?...I'm not a roofer but I love reading this message board. I've installed a couple simple slate shed roofs and enjoy doing things right. I assume that a keyway is the verticle gap between slates and that by fitting them tight together you lose the ability to spot the mistake you reference here ? I not sure if I see what you are are getting at. Are you saying that slate was installed up side down? Then also you install your slate roofs with around a 1/4" keyway, not tigth together? Merry Christmas to you too Tinner. Very good! Man oh man! On a recent roof I was doing with used slate, I pulled this guy out of the pile. 12x16 Buckingham. You could tell this came off a roof where they were butted together. Nobody ever found this leaker until they gave up and tore the roof off. The ridge must be 3/16" high. It's why I like to see 1/4" keyway. It may make bone head mistakes findable. I won't even go into how or why this wasn't culled first time around before it ever got installed. I keep it in my shop for show and tell for clients.